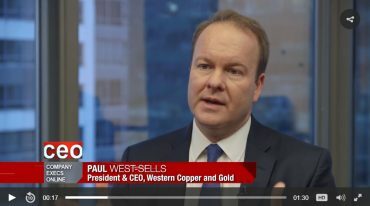 Watch President & CEO Paul West-Sells’ recent interview with CEO Clips, aired on BNN in March 2019. President & CEO Paul West-Sells sat down with INN at the recent PDAC Conference in March 2019. President & CEO Paul West-Sells’ recent interview with Proactive Investors at PDAC 2019. President & CEO recently sat down with Ellis Martin to provide an update on #WRN and Casino. On November 22nd and 23rd, 2018, Western Copper & Gold`s Director of Corporate Development Chris Donaldson presented highlights and outlook of Western Copper & Gold`s equity story to the investor audiences of Miningscout’s 3rd German Resource Investment Days in Frankfurt and Munich.